Wally Pereyra, gearing up for a new land use appeal over development affecting Ebright Creek. A tiny, two-home short plat is at the heart of what’s likely to be another appeal to protect environmentally sensitive Ebright Creek. The applicants, Clifford and Pauline Cantor, first filed for development 16 years ago. Sammamish’s leading savior of the threatened kokanee salmon, the only salmon native to Lake Sammamish, is taking the next step to save the species: the restoration of Zaccuse Creek. 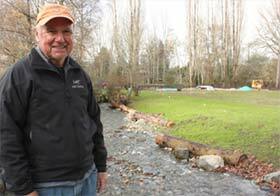 Wally Pereyra, who spent hundreds of thousands of dollars to restore Ebright Creek to help save Kokanee salmon, is moving on to Zaccuse Creek as the next phase of his decades-long effort. the Kokanee are native to Lake Sammamish. Photo via Google image. Click on image to enlarge. Wally Pereyra, who already spent hundreds of thousands of dollars of his own money to restore Ebright Creek and to appeal City of Sammamish approvals of upstream development he believes would harm Ebright Creek, is preparing to restore Zaccuse Creek in cooperation with the local Snoqualmie Tribe and, he hopes, the City. Planning began several years ago. A June 2012 study with King County surveyed the creek, a culvert that goes underneath East Lake Sammamish Parkway and upstream and downstream from Pereya’s property. The study has several photos illustrating the 25 page report. Pereyra owns several large parcels of land south of Thompson Hill Road, continuously along the Parkway to his residence.